Gaius Julius Caesar was born to an aristocratic family. His parents were Gaius Julius Caesar and Aurelia. Julius was born on July 13th, 100 BC for whom the month of July is named. 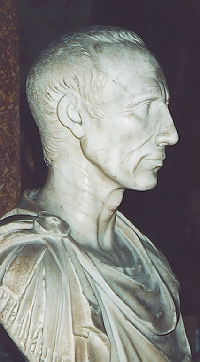 During the early years of his career, Caesar identified himself politically with the Populares Party (See Marius), which opposed the Senatorial nobility. His political views therefore cast him as a political enemy of the dictator Sulla, which became clear when he married Cornelia. Only with the aid of influential friends was Caesar able to escape Sulla’s reign of terror (83 – 82 BC) by fleeing to Rhodes. Caesar used the time in exile to study oratory. He also used his time in Rhodes to gain military experience along the Eastern Mediterranean. Following the death of Sulla in 78 BC, Caesar returned to rejoin the few remaining supporters of government reform. He began rebuilding relationships aimed at forming a foundation for possible future power. When Pompey and Crassus received their Consulships in 70 BC, most of Sulla’s laws were abrogated. In 69 BC, Caesar managed to be assigned as Quaestor in Spain and then in 65 BC. was appointed Aedile (an official in charge of buildings, etc.). He received the coveted Pontifex Maximus (Chief Priest of the Gods) in 63 BC. Caesar was suspected of having secret knowledge of a conspiracy centered around Lucius Sergius Catalina involving a plan for the burning of Rome and the murder of many of the Chief Magistrates. Crassus was also suspected of being involved. Catalina was killed by Metellus Celer and Gaius Antonius, after many of Catalina’s followers had been arrested and executed. Somehow, Caesar (and Crassus) managed to disassociate themselves from the conspiracy. Despite the suspicion of Caesar’s possible prior knowledge of the so-called “Catiline Conspiracy,” Caesar managed to be elected Praetor (Magistrate, the office just below Consul) in 62 BC, in which he served with distinction. His major political achievement, however, was the formation of the “First Triumvirate” with Pompey and Crassus, whereby he associated himself with the two most powerful politicians and military men of the day. Caesar, as part of the agreement, became Consul in 59 BC and received a commission to go to Illyricum and Cisalpine and Transalpine Gaul as Governor for a period of five years, a term later extended to ten years. In order to strengthen the political bonds with Pompey, Caesar gave his daughter Julia in marriage to Pompey also in 59 BC. Julia proved to be an important influence upon both men often forcing them to settle their differences and compromise. Unfortunately, Julia died in 54 BC and with her went the one true mediator between Pompey and Caesar. Caesar’s military exploits in the West had rivaled those of Pompey’s in the East. Caesar was able to add all of Gaul Expeditions between the Rhine River and the Pyrenees Mountains to the Roman Empire. This was in addition to two “Warning Expeditions” which he had made to the coast of Britain. Caesar’s military accomplishments, together with the death of his daughter, Julia, and the death of Crassus a year later in 53 BC, allowed the two to drift further apart politically. Pompey proved to be easily influenced by the corrupt Senate of Rome, which was primarily interested in retaining their old boy’s network of privileged status and trade monopolies. Corruption in the Senate became outrageous towards this point in history. Elections were routinely fixed and no one other than the privileged few could even run for office. The corruption had escalated to the point that the calender had been altered so many times in order to extend the various factions terms of office that summer took place where winter once ruled. Caesar soundly defeated Pompey’s army at Pharsalus in Thessaly, on August 9th, 48 BC. Pompey fled from Rome, as did many members of the Senate. Pompey fled to Egypt where he was beheaded. 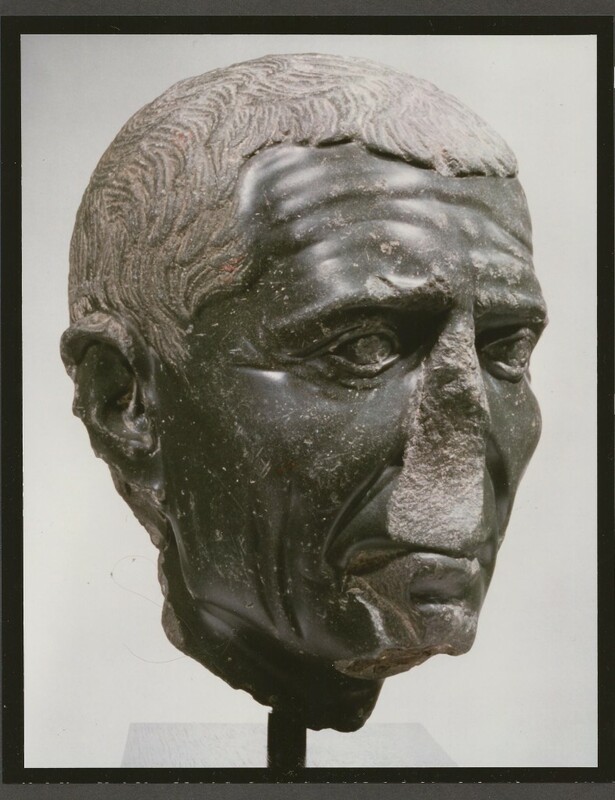 When Caesar arrived in Egypt, he was presented with Pompey’s head. It was during this trip to Egypt where Caesar first met Cleopatra VII, eldest daughter of Ptolemy Auletes, King of Egypt. Pompey had been murdered by her brother, Ptolemy, which greatly displeased him to say the least. 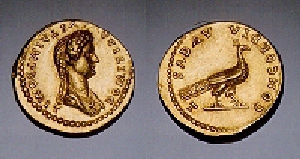 Caesar then arbitrated the dispute between Cleopatra and her brother for the throne ruling against Ptolemy who gathered his forces and attempted to destroy Caesar’s legions. In the ensuing battle, the Great Library of Alexandria was burned. Ptolemy was defeated and Cleopatra was installed on the throne by Caesar. In the time that passed, Caesar became intimately involved with Cleopatra and it is believed that they may have had a son named Ptolemy Caesarion. When Caesar left Egypt, Cleopatra had ascended to the throne of Egypt, sharing it with her younger brothers, Ptolemy XIII and XIV. Caesar spent the next two years defeating the remnants of Pompey’s Senatorial armies at Thapsus in Northern Africa in 46 BC and at Munda in Spain on March 17th, 45 BC, where Pompey’s two sons, Caenus and Sextus, barely escaped with their lives. Finally, Caesar conducted a swift five-day campaign, in which he defeated Pharnaces II of Pontus and produced Caesar’s famous boast “Veni, Vidi, Vici” (I came, I saw, I conquered). Caesar was now the undisputed ruler of the Greco-Roman world and he set about a major political and economic reform project. While much of what has been written about Caesar in an attempt to portray him as a ruthless dictator, the evidence does not support the bias of many contemporary writers. It must be kept in mind that the Senate of Rome had been dominated by the aristocratic families seeking special business concessions or monopolies in trade. The entire process of the once great Roman Republic had become very corrupt prior to the civil war. Economic conditions had declined severely and the economy was in serious recession. Real estate values had plummeted and lenders refuse to accept property in return. We must also keep in mind that the majority of the money lenders were none other than the Senators themselves. In the context of this atmosphere, Caesar proposed to rule as Dictator. His actions, though, were always with an intent to better the lives of Roman citizens. Again, some will argue that Caesar expanded the Senate of Rome in an attempt to dilute its authority. However, this expansion of the Senate, including the building of the Curia, could also be interpreted as an act to break the monopolies that had existed within the Senate. The benefit would logically produce a better and much more representative form of government. The new Curia was built in the heart of the Roman Forum which still stands today. 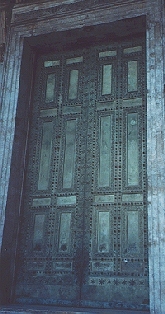 The bronze doors, personally commissioned by Caesar, are to be found today still in use at the Church of Saint Latern in Rome. Caesar’s legal reforms were simply brilliant. He regulated and systematized municipal government throughout Italy and introduced social and economic reforms, including a drastic reduction of the number receiving the dole of grain (modern day welfare reform). He also established the annual rate of interest at no higher than 12% bringing an end to loan-sharking which had devastated the lower classes. Caesar also completely reformed the old Roman calender into a scientific one based upon astronomical calculations that for the first time included the concept of Leap Year. His efforts in this regard led to the development of the “Julian” calendar. In the field of commerce, Caesar planned the construction of a major canal through the Isthmus of Corinth, and a codification of the current existing rule of Roman Law. One can only imagine how even in our modern democratic societies the corruption and self-interest of the various political parties and individuals at times bring progress to a halt through sheer grid lock. With corruption so wide spread and the great injustices against the common man left uncorrected, even after the Social Wars of 90 – 89 BC, the atmosphere within the Senate of Rome must have been indeed fully charged in light of Caesar’s reforms. Indeed, Caesar’s ambitious reform program threatened the very institutions of the Republic, not for the sake of the common man, but from the viewpoint of the self-interest of the corrupt Senate. Their thin veil of pretense of caring for the state was at last lifted and what was suddenly revealed for all to see was a corrupt network of control and deceit for personal gain. Within such an atmosphere, Caesar dared to hold true to his beliefs of a free society void of aristocratic control. A new Republic was Caesar’s goal in which elections would be legitimate and corruption tempered and controlled. That could only be accomplished at this late stage in Republican history by a benevolent dictator who would be trusted by the people. Caesar was that man. He made no attempt to abolish the Senate or the election process. There were no attempts to establish a kingdom in Eastern traditions. The reform program of Caesar came to a sudden end with his assassination led by Marcus Brutus and Gaius Cassius on the Ides (15th) of March, 44 BC. In this last desperate act, the noble Caesar fell by the hand of the corrupt Senatorial oligarchy. The assassins of Caesar tried to paint their deed in the shining light of liberty. But Caesar’s reforms were not self-serving and always placed the good of the Roman people above that of their corrupt Senate. Following Caesar’s assassination, Marc Antony immediately took possession of Caesar’s papers and residence, including whatever assets he had held. Antony then gave his famous funeral oration in the Forum standing traditionally upon the Rostra of Rome. There Antony delivered his impassioned speech which proved to be instrumental in turning the people against the corrupt Senators who by now had become mere assassins. Shortly before his death, Caesar had written a will in which he adopted as his son, his great-nephew Gaius Octavius, grandson by his stepsister Julia. Octavian, at the time, was relatively young though a prominent member of Caesar’s entourage. By the stroke of fate, Octavian would later become Rome’s first Emperor known to history as Augustus. As for the assassins, Marc Antony and Octavian chased them down and had them all put to death. 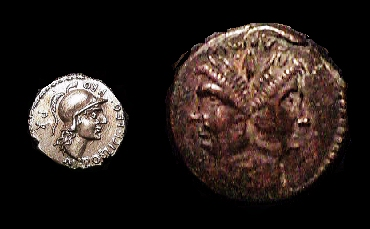 Due to the political climate following the assassination of Caesar, the coinage reflected very much the need for propaganda on both sides. The supporters of Caesar often displayed their own portrait on the reverse of many issues thus trying to invoke the love and loyality that the people had felt for Caesar in their own cause. Likewise, the assassins usually displayed a bust of liberty trying to argue that they were for the Republic despite the fact that the Republic had become so corrupt and the Senate merely a gathering places for the old boys to divide the spoils. 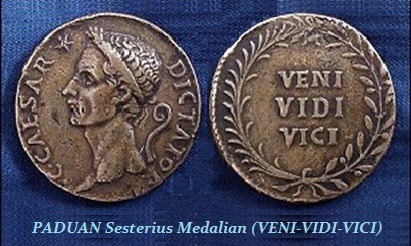 In the case of Caesar, his portrait appears in conjunction with Octavian and Marc Antony. However, his portrait appears on several issues of other supporters who simply inscribed their name on the coinage and not their own portrait. Sextus Pompey was born in Rome, the younger son of Pompey the Great by his third wife, Mucia. Sextus was a gifted pirate leader from Orca between 43 and 36 BC. He gained position among the Pompeians only after the death of his father in 48 BC at the hands of the Egyptians. Joining his brother, Gnaeus, in the Balearic Islands after the defeat at Thapsus in 46 BC, Sextus subsequently served in Spain as a general in the legions against Caesar. In 45 BC, he fought against Caesar along with his brother in Spain at the Battle of Munda and lost. His brother Gnaeus once again escaped but was finally captured and beheaded. Most of the remaining Pompeians, including Labienus, were either killed or surrendered. Sextus, however, managed to successfully escape to the remaining Pompeian fleet, where he became the last remaining leader of their cause. When the Second Triumvirate was formed by Marc Antony, Octavian and Lepidus, a list of prescribed names of men who were supporters of Brutus was produced. Sextus’ name was on that list. By August of 45 BC, Sextus’ naval command was outlawed. Sextus fled to Sicily, and with the large fleet of ships at his disposal, he began to raid the sea-lanes of Rome for profit returning to his old trade of piracy. Sextus was indeed a skillful pirate. He turned the Mediterranean into a very dangerous place to do business. Sextus attacked any sea traffic that looked to be profitable and even began to raid the Italian coast. His band of supporters grew as he supplied a safe haven for all those condemned by the new Second Triumvirs. Sextus finally managed to form an alliance with Marc Antony around 40 BC, but was quickly broken. Under the favorable terms received by Antony at the Conference of Brundisium in 40 BC, any support from Sextus was no longer necessary on Antony’s part. By 39 BC, Sextus was once again attacking shipping but this time his raids endangered the vital corn supply of Rome. Octavian and Antony decided to meet with this pirate who became known as the “Master of the Mediterranean.” During the spring of 39 BC a conference was called at Misenum, yielding what became known as the Treaty of Misenum. According to the terms of this Treaty, Sextus agreed to respect Italy, to leave the corn shipments alone and to cease all hostilities. In return Sextus was given a position of respect and the promise of an augurship as well as a consulship. In 38 BC, Octavian reopened the power struggle and needed to remove Sextus and his naval power. Octavian launched an attack against Sextus in Sicily which was followed by two years of defeat. Finally, Octavian sent his friend Marcus Agrippa against Sextus and the Mediterranean pirates in 36 BC. Agrippa faced Sextus in the Battle of Naulochus in where the forces of Sextus suffered a major defeat. Sextus once again fled the scene this time escaping to Asia Minor. Despite all the trouble he caused Rome, Sextus was still very popular among the people as is often the case with glorified criminals. It was this popularity in Rome that caused Antony to allow Sextus to finally live in peace. But Sextus tried once again to regain his lost political fortune, which led Antony to send his legate M. Titus who finally put Sextus to death. Gnaeus Pompey was the eldest son of Pompey the Great, by his third wife, Mucia. Gnaeus was a loyal officer who fought along side his father. He joined his father and the corrupt Senate of Rome during the Civil War in opposition to Julius Caesar. In 48 BC, Gnaeus burned part of Caesar’s fleet and harassed the ships of Marc Antony during the Dyrrhachium campaign. 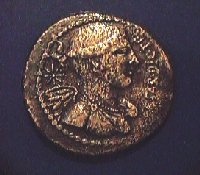 Following the defeat of his father at the battle of Pharsalus, Gnaeus fled to North Africa where he became one of the leaders of the Pompeian cause. In 46 BC, Gnaeus was dealt another crushing blow by his defeat at the battle of Thaosus. Becoming a master at escape, Gnaeus managed to flee the battle scene once again this time sailing off to the Balearic Islands, where he was joined up with his brother – Sextus. Both the remaining sons of Pompey the Great sought once again to raise yet another army this time in Spain. Caesar arrived in Soain during 45 BC and the conlusion was not much different from before. The resulting battle of Munda was hard fought but the victor once again was Julius Caesar. However, Gnaeus’ ability to escape came into play once again as he managed to flee the battle scene. Nonetheless, this time Gnaeus ran out of supporters and safe havens. Within a matter of a few weeks, Gnaeus Pompey Junior was hunted down, captured and beheaded. 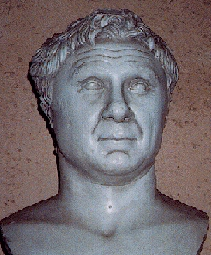 GNAEUS POMPEIUS MAGNUS (Pompey the Great) was Rome’s most famous general during the later period of the Republic. He was the son of Pompeius Strabo who was born in 106 BC. Pompey was married several times. Finally, during his third marriage to Mucia, his two sons were born – Gnaeus Junior and Sextus. When Pompey was only 17 years old, he served in the military campaign during the Social War (90-88 BC) when the whole of Italy rose up against the dominance of Roman power. Pompey fought on the side of Sulla against the Marius in 83 BC upon Sulla’s return to Italy following the Mithradatic War. Pompey’s brilliant skills were largely responsible for Sulla’s victory over the army of the Marian Party. However, it was his successful campaign in Africa in 81 BC, when Pompey was given the surname “MAGNUS” (the Great). Marius had been an uneducated man of humble origins. His rise to the rank of senator was previously unprecedented. Lacking noble heritage, Marius was a man of the people and not the favorite of the Senate. Thus the conflict between Sulla and Marius was perhaps the first warning signs that the Republic would eventually fall from its own internal political corruption. Following his African campaign, Pompey led a victorious five-year campaign against the Marian leader, Sertorius, in Spain which came to an end in 71 BC. Pompey also claimed credit for the final victory over the embarrassing slave revolt led by the slave Spartacus, despite the fact that the battle had actually been won by Marcus Licinius Crassus. Pompey was then appointed Consul in 70 BC. Following his Consulship appointment, Pompey set out to wipe out the pirates that had been dominating the Mediterranean Sea. Pompey managed to accomplish this task in only three months during 67 BC. By 66 BC, Pompey took command of the Roman army from Licinius Lucullus, whose spectacular victories over Mithradates were viewed too slow in coming for the impatient Senators. Under Pompey’s command, he brought the Third Mithradatic War (74-65 BC) to a glorious victory, whereupon he then annexed Syria and Palestine adding them both to the Roman Empire. Pompey reached a level of such power through his military accomplishments that he almost assumed dictatorial powers that had been granted to him by the Senate for the conduct of the Mithradatic War. However, Pompey set aside these powers, and returned to Rome where, in 60 BC, he formed an alliance with Julius Caesar and Marcus Crassus. In 60 BC the alliance between Pompey the Great, Julius Caesar and Marcus Licinius Crassus became known as the “First Triumvirate” thus setting the stage for what would eventually become the birth of the Roman imperial government. 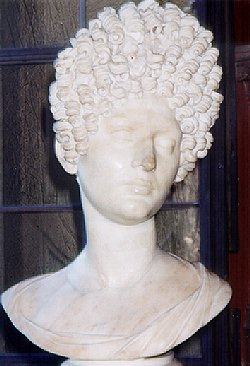 Pompey married Caesar’s daughter, Julia in 59 BC, with the intent that this would strengthen the bond between these two men since they had been on opposite sides during the war between Marius and Sulla. Crassus had also supported Sulla against Marius but Crassus had been saved by Caesar during the Catiline affair. Crassus had shared a consulship with Pompey during which the two men argued almost constantly. Crassus also never forgave Pompey for stealing the glory for the defeat of Spartacus. Thus it was a political partnership very much designed by Caesar. Shortly thereafter, Caesar departed from Rome to assume the conquest of Gaul (59-49 BC), leaving Pompey and Crassus in charge of administration in the capital city. Unfortunately, the bonds between Pompey and Caesar were not altogether that strong and Julia proved to be the great mediator. Unfortunately, Julia died in 54 BC while in childbirth. Crassus was killed in 53 BC, while undertaking an expedition into Mesopotamia against the Parthians. With both Julia and Crassus gone, there was little to prevent these two men from drifting apart. While Caesar’s conquest of Gaul was starting to rival Pompey’s past victories, Pompey was getting jealous at losing his place of honor in military history. The corrupt Senate of Rome also sought to exploit the situation by undermining the alliance between Caesar and Pompey in order to retain their privileged institution through which their vast trade monopolies were maintained. Civil war was now unavoidable. Caesar gathered his army and crossed the Rubicon River which formed the border between his province and mainland Italy and proceeded to march toward Rome. Pompey had miscalculated Caesar’s resolve, skills and intelligence. The majority of the Senate was now terrified realizing that they had gone too far. Pompey hastily mobilized his army and fled across the Adriatic Sea with the majority of senators. Caesar entered Rome without any resistance. Pompey set about building an army in Greece for the inevitable clash with Caesar. But Caesar instead moved on to Spain quickly removing his enemies and any of Pompey’s supporters. Caesar was no fool. His move into Spain was unexpected by Pompey. After protecting his rear, Caesar then returned to Italy and sailed across the Adriatic to confront Pompey’s still unprepared army. In a decisive battle at Pharsalus in Thessaly on August 9, 48 BC, Pompey was utterly defeated. The once great general of Rome retreated on a ship bound for Egypt where he had hoped to find sanctuary. Upon his arrival in Egypt, Pompey was brutally slain by order of Ptolemy, King of Egypt. Pompey was no match for the brilliant Julius Caesar. Pompey’s greatness was in confrontation – not in strategy and long-term planning. Thus the once Pompey the Great ended pleading for his life in Egypt only to have his head handed over to Caesar upon his arrival. 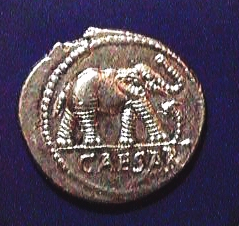 Note: Commemorative coinage was issued by Pompey’s sons Cnaeus Junior and Sextus as they mounted armies against Caesar in the aftermath of their father’s death. These commemorative issues were more intended to rally political support for the cause than honoring their father’s death. 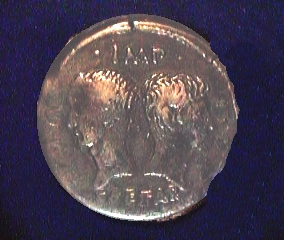 The Roman bronze As, which had traditionally displayed the two-face head of Janus took on the likeness of Pompey the Great. 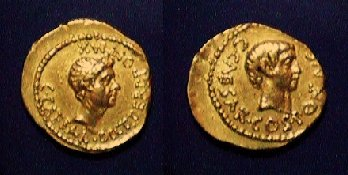 Their father’s portrait also appeared on several types of denarii and on the reverse of the gold aureus of Sextus. 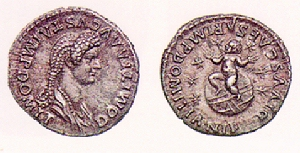 Domitia Longina was the daughter of Nero’s famous general Gnaeus Domitius Corbulo. 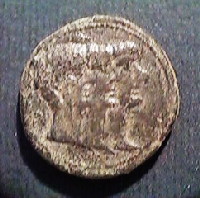 Domitia first married Lucius Aelianus Lamia. In 70 AD, she divorced her husband and married the Emperor Domitian. Domitia bore two children with Domitian, a daughter and a son who lived briefly in 73 AD. Domitian was a very jealous man and rumors of Domitia’s unfaithfulness led to her exile and the death of a suspected lover the actor Paris. Domitian divorced Domitia in 83 AD. She was sent into exile and her life spared on the urging of Ursus, a trusted advisor to Domitian. During this period, Domitian took up residence with his brother’s daughter Julia Titi. Julia eventually became pregnant and Domitian insisted upon an abortion during which Julia died. Reconciliation between Domitian and Domitia eventually took place. However, as time passed, Domitian became increasingly suspicious of everyone and put to death anyone he believed to be disloyal. According to the historian Dio, Domitia found her name on a list of people suspected of disloyalty. Domitia took the list to one of her own allies, the Prefects Norranus and Petronius Secundus. Together they plotted the assassination of Domitian. The plot was carried out by a slave named Stephanus who repeatedly stabbed Domitian to death. Domitia lived on for several years well respected by the citizens of Rome.